Beach carts are the best way to transport whatever you may need for a day at the beach. Whether it be big or small, light or heavy, a beach cart is able to get it from point A to point B with ease. They are also versatile, use them for camping trips, and even hikes. 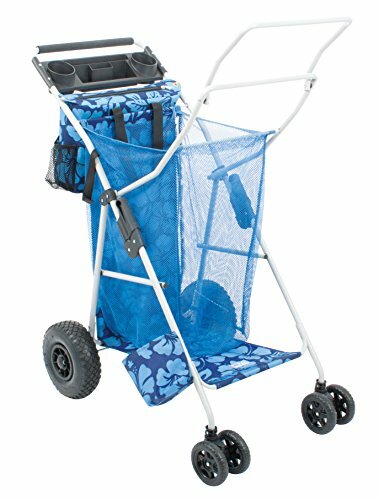 This beach cart from Rio Brands is one of the best on the market. It has a 100-pound capacity and 15 cubic feet of storage. It can easily hold your cooler, beach chairs, an umbrella, and almost anything else you may need. It is a foldable cart, meaning there is no need to try fit it into your small boot or car, it just folds right up. It is also fitted with rugged all-terrain wheels, allowing you to take it on beach sand, as well as gravel or ground if you are using it for camping. 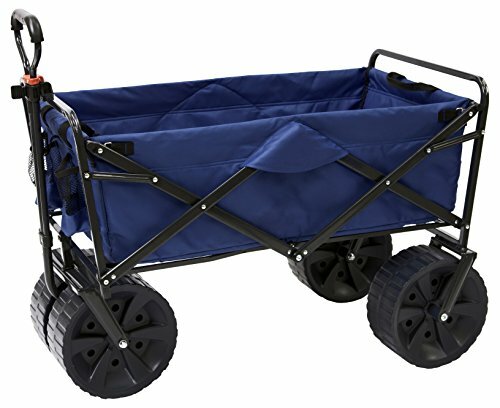 This foldable and collapsible wagon from Mac Outdoors is tough and rugged and designed to take a hit and last you years. It is made of strong 600D fabric that is stretched around a very heavy-duty frame. 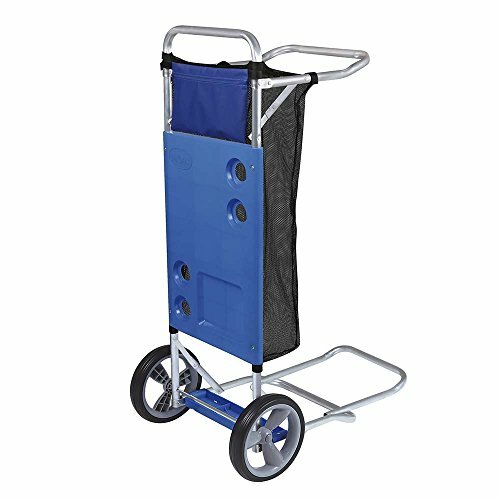 Due to the strong fabric used and heavy-duty frame, this cart is able to transport up to 150 pounds of gear or cargo. It is brilliant whether you are at the beach, going to a concert or at the park. This is another heavy-duty cart, but this time from Tommy Bahama. The all-terrain cart does exactly what it says, goes all-terrain. The 10-inch rear wheels allow it to glide over the side, while still being able to move effortlessly over gravel. The cart can hold up to 4 chairs, a 48-quart cooler, and a ton of extra accessories and beach gear. It also has a removable insulated bag for keeping a few drinks or some food cool. It also folds flat, making storage and transportation easy. This cart from Rio Beach Brands can be called the upgraded cart of the one we reviewed earlier. It is made with the same high-quality materials and is just as durable, but features some extras such as a large storage pocket and a utility tray. The cart itself can hold a 48-quart cooler and 6 beach chairs, while the utility tray has holders for cups, your smartphone, and a tablet. The cart also has an umbrella holder and an insulated cooler bag. This is a more simple cart from Rio Beach Brands. It has a traditional design and allows you to stack your cooler, chairs, and umbrella. Having a weight capacity of 50 pounds means it is for more simple jobs and transporting smaller and lighter items. 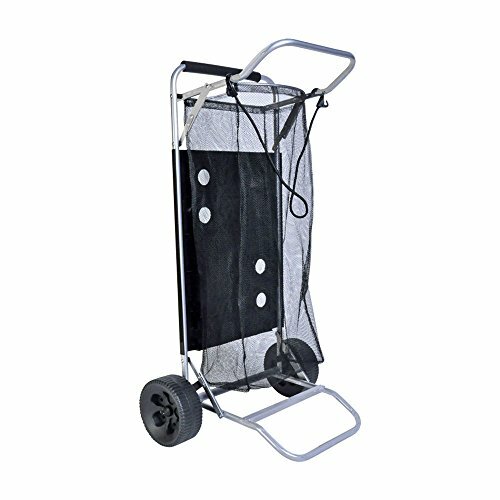 The cart itself has a mesh pouch to store smaller items, and it also has a bottom tray and rack. It comes with a bungee cord so you can tie your gear down to stop it from falling, and the cart folds up for easy storage and transportation. This heavy-duty wagon from Mac Sports has a storage capacity of 150 pounds and allows you to transport absolutely everything you may need for a day at the beach or a day camping, plus a few extras. The foldable design makes it easy to transport and store, and once you need it, the set up takes only a few seconds. The extra large wheels ensure the cart doesn’t get stuck and any sand or gravel. This versatile beach cart from Rio Beach Brands not only allows you to easily and simply transport your gear across the beach or campsite but once you get to your spot, it doubles as a very handy cart table. This foldable cart is unique in the way it is made. It is made of an aluminium composite, which does not warp like fibreboard does. The composite has a core made of hardened plastic, which stops the cart from warping and decaying. This cart from BeachMall is another relatively simple but versatile beach cart. 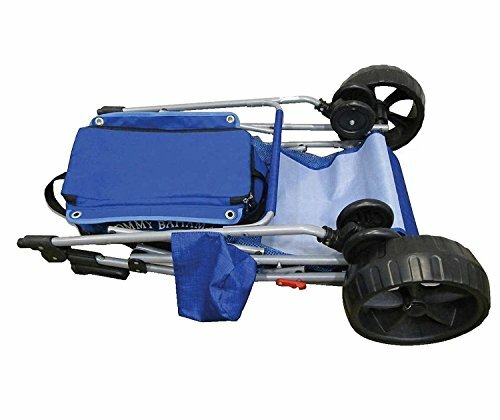 It has a weight capacity of 75 pounds, and you can easily transport your cooler, beach chairs, umbrella, and towels. The table is a great extra for setting up a picnic at the beach. 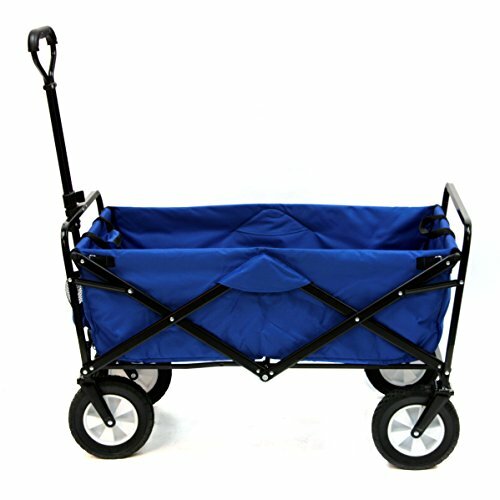 You can fold the cart to almost completely flat, and the removable wheels make it even easier to store and transport. The frame of the cart is made of powdered steel tubing, which is rush resistant. This beach cart from Mor is made of aluminium, including the rivets and fittings, which prevents rust that is usually associated with ocean air. The cart also has a polypropylene table top. 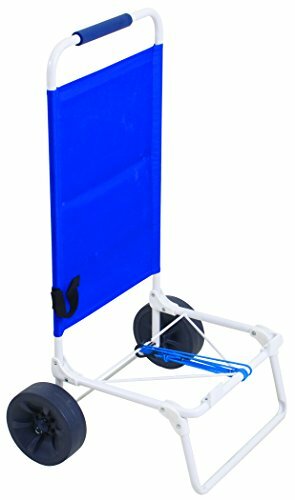 The cart can hold up to 6 beach chairs and an umbrella, but it comes with an extension that allows you to transport a 46-quart cooler. The cart also has bungee cords to hold everything in place, as well as cargo netting for extra storage. This utility wagon from Timber Ridge is foldable and extremely compact, and with the push of one button, the wagon unfolds and is set up in a few seconds. It has a weight capacity of 110 pounds on the beach and 150 pounds on hard surfaces. The cart is fitted with 4 oversized wheels that give it traction and grip on almost any surface. The back wheels are static and do not turn, while the front ones do, giving you great control and stability on uneven surfaces. 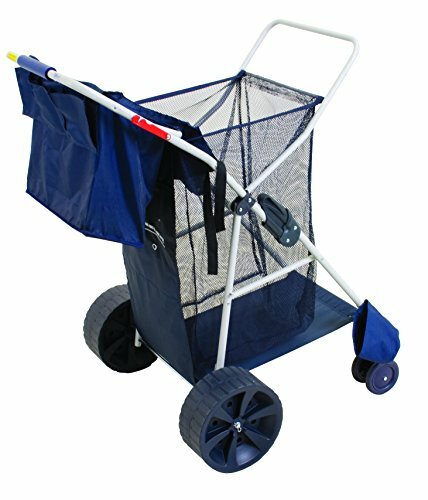 A beach cart is a brilliant piece of gear if you are a frequent beach-goer or camper. It allows you to transport everything you need with ease, without having to strain yourself or go back for multiple trips.